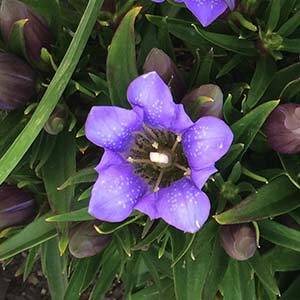 With large bell shaped flowers Gentiana scabra is an evergreen ground cover plant that will flower in autumn. The flowers are upward pointing, the foliage dense and green. Although not widely grown in Australia, this is a very useful and attractive garden plant. Gentiana scabra in a position where it can be seen easily, it is very low growing and the flowers are held near ground level. Excellent when grown in containers and it is a plant that will grow and flower in part shade. Well suited to growing next to pathways in narrow areas. Being a low maintenance plant that works well as a ground cover as well as having flowers Gentiana scabra is a very useful plant in a range of situations. Gentiana scabra var. ‘Shin Krishna’ – Blue to Purple Flowers. Care of and Planting Gentiana scabra. Prepare the soil by digging in some well rotted compost and amending the drainage if required. Plant Gentiana scabra at the same level it was in the container. Firm in well and water in with a liquid seaweed fertiliser. Check the moisture of the soil and water as required – Be careful not to overwater. Mulch around the plant lightly to help retain a cool moist root run. Large clumps can be divided in late winter to spring as soon as the weather warms a little. simply dig the clump, divide into 2 or 3 and replant. Generally not required unless you are dividing the clump. Soil – Humus rich well drained soil with some moisture. Flower Color – Blue to White and Pink depending on variety.